Mustang Tiji Festival Trek | Trek to upper Mustang for Tiji festival. Mustang Tiji Festival Trek – Despite the fact that the relative seclusion of the Mustang area is the thing that draws in voyagers to this range and adds to the other-worldly like scenes, the seclusion likewise adds to the development of an exceptionally special culture and customs. Mustang is the place that is known for desert like scenes observed by some of the most elevated snow-topped Himalayan peaks. The river Kali Gandaki adds to Mustang’s excellence with its entrancing light blue waters which is also the principle water source for the area. Mustang Tiji Festival Trek will take you on a voyage through Mustang’s remarkable scenes and will give you a wonderful opportunity to jump deep into the way of life of the inhabitants. Explorers will have the ability to study the way of life of Mustang through the observation of the Tiji celebration. The Tiji celebration is a standout amongst the most critical occasions for the people of Mustang and uncovers the heart of Mustang’s way of life. In this occasion, the myths and legends of the region are performed and re-enacted, leaving the spectators amazed by the uniqueness of the exhibitions. Maroon clad priests and entertainers wearing veils move to the thumps of the drum, joined by the sound of horns and cymbals, intended to pursue away the evil presences and welcome the growing season. This trek is perfect for the explorers who want to feel both the magnificence of nature and the culture of the region. The meals provided by Himalayan Vista Team are plentiful and delicious, We will have our own private cook during the trek. For the breakfast it’s usually a variety of cereals, bread and eggs. And for lunch and diner it is usually rice, noodle or soup and seasonal vegetables. If you want to buy snacks, the accommodations sell plenty of biscuits, chocolate and soft drinks and in some areas you will fi nd fresh fruits in season. This Trek graded as moderate are generally a bit longer, lasting for up to 15 days. The trekking time per day can be between 5-8 hours and the altitude goes as high as 4500 meters. However, trekkers do not linger on those altitudes for a long time. The routes can have significant uphill and downhill parts and trekkers should expect small snow patches on the higher altitudes. All travellers age should be 12+ and under age 18 must be accompanied by an adult. Today, we organise a sightseeing day in Kathmandu. This old city provides many beautiful monuments and temples listed as UNESCO World Heritage. You could visit, the old temple of Pashupatinath, dedicated to Pashupati, who is the incarnation of Shiva. It is an important holy place for all Hindus. Also, we will guide you to the famous Royal Place of Durbar Square with its beautiful architecture. Finally, you will discover like a little part of Tibet in BoudhanathStupa area. Many little shops with Tibetan handcraft surround this huge stupa. During the evening, you could wander freely in the streets of Kathmandu. It is a long way through Nepal on roads both tarred and earth-surfaced, but you won’t be disappointed. You will discover the beautiful countryside of Nepal. Lush greeneries, villages, farms, rivers, lifestyle of local people in the streets and the panoramic view on the Himalaya range. 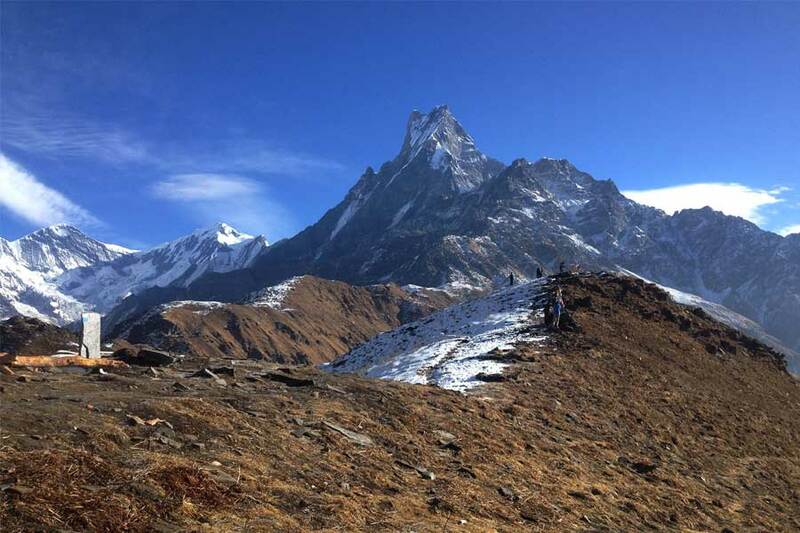 To reach the beginning of the trek, you will take a scenic fly with spectacular view on the Annapurna range, Dhaulagiri Mountains and world’s deepest gorge, Kali Gandaki. Once upon arrival, we could start the trek. It will start with a gentle and flat trail, which provides all along the way a good view on Nilgiri, Dhaulagiri and Tukuche Peaks. 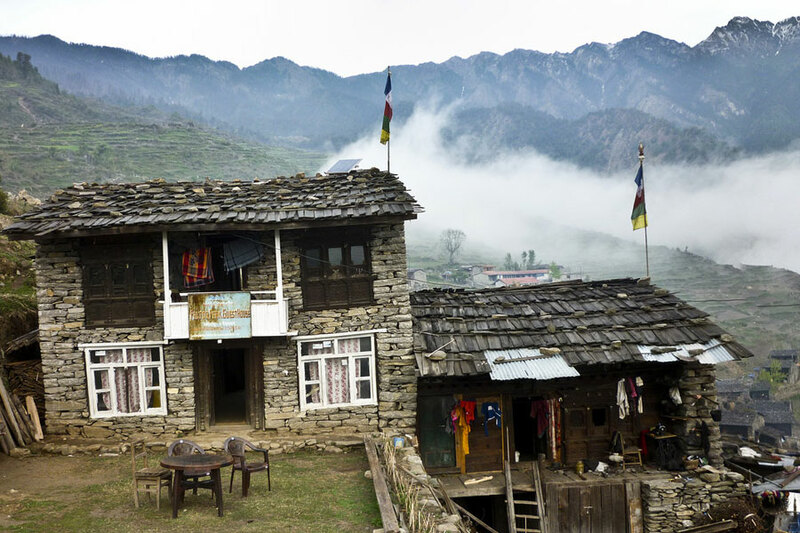 Kagbeni is an antique village, which will give you a glimpse of what you could expect during the trek. You will have time to explore the narrow alleyways and tunnels, irrigation canals, green fields of wheat and barley. Today we will enter to the restricted area of Upper Mustang. As said to be the desert of Nepal the valley widens with barren and arid surroundings with green villages in the middle that appears more like a mirage, which is simply incredible. 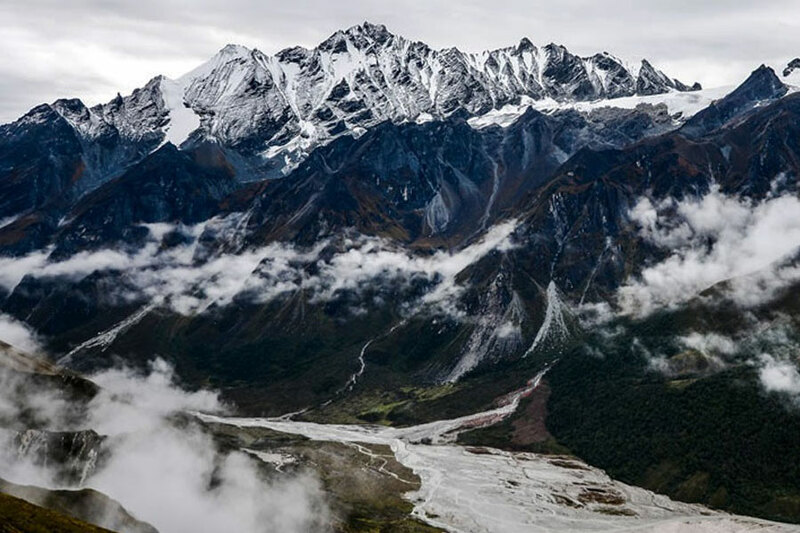 We will follow the Kali Gandaki River (an important tributary of the holy Ganges) and walk through small villages surrounded by fields of wheat, barley and buckwheat, interspersed with small apple orchards. Chaile village is perched on a hill, it will be a steep climb to reach the top but, it will give it to you a beautiful panorama view on the area. The climb continues along steep in a dry area above a deep canyon. Then, the trail steeply descends in a large gorge surrounding by streams. A new steep climb up to a ridge at 3,800 meters of altitude is waiting for us before to go down to reach those whitewashed buildings of Geling village. We continue our trek in a surprising and spiritual area with blue, grey and red cliffs. We have to cross the Tangmar Chu River on a bridge and walk along the longest and most spectacular Mani walls in Nepal. Charang village provides some huge Dzong and a red Gompa, which houses an excellent collection of statues and Thankas as well as many large paintings of seated Buddha’s. Today, the track will go up and down with some beautiful viewpoints. From Lo-La Pass, we could enjoy the spectacular view of Lo Manthang and the valley of Thinkar and Chhosar. Also from the top of a hill you could see some historical ruined. And finally, we will get the walled city of Lo Manthang, where you will stay for its famous festival. During 3 days, the capital of Mustang area is alive with traditional music and dance. Front of the Royal Palais, the Buddhist monks perpetuate an ancestral ritual representing the struggle against demons. Tiji tells the story of a deity named DorjeJono who must battle against his demon father to save the Kingdom of Mustang from destruction. The demon father wreaks havoc on Mustang by creating a water shortage, which, in this extremely arid land, is the most precious life-sustaining resource. DorjeJono eventually defeats the demon and banishes him from the land. colourful jewellery, monks in their robes and dancers in elaborate costumes make the entire environment vivid and vibrant. An experience back in time, which will submerge you in the Buddhism culture for the next 2 days. Today, you could enjoy a colourful ceremony accompanied by an unusual dance of Tibetan lamas. It is done to chase away all the hungry and evil spirits from the village. You could see many people across the region participating in this ritual of purification and renewal. Moreover, Lo Manthang provides the surprising construction of the Nyphu Cave monastery built into the side of a soaring cliff and the 2500 years old Jhong Sky Cave with a maze of corridors and compartments. The Tiji festival ends with the ceremonial destruction of the evil remains, represented by some long black yak hair and “red torma”(cake offering) minced to a dark red furry. The demons red remnants are set out on an old tiger skin, where-upon they are attacked by bow and arrow, slings, and the old guns. The poor devils remains are over-turned upon the ground, each time to a wild cannonade from the old muzzle-loaders and a wave of cheers and smoke. You also have the option to visit the Tall ChampaLakhang “God house” the red ThugchenGompa, ChyodiGompa and the Entrance Hal which are the main attraction of this town. Today, we will visit the village of Thingkar and its summer palace, which is abandoned and not anymore in use yet it’s worth hiking around. Alternatively we can climb up the viewpoint hill just north of Lo Monthang for the stunning view of all around the valley. Also, NamgyalGompa situated on a hilltop, which serves as an important monastery of the local community and also as a local court. We will make our return with a trail, which climbs steeply. On the top, you could admire the last glimpse of Lo Manthang. Then, we will reach Chogo La Pass (4,325meters), the highest point on this trek. Finally, the track going down to GharGompa, which is more than 1200 years old and famous for its rock paintings and the legend of fulfilling our good wishes. We will keep retracing our trail to Geling. You have to be award with the possibility of strong wind in this dusty area. Geling is a small village dominated by a fortress and a monastery of Sakya School. As on the first way, we will stop for the night in the village of Chele and you could enjoy for the last time the beautiful panorama offering in this village perched on a hill. It will be our last trekking day and it is an easy trail to Jomsom..Time to congratulate yourself about your trekking into the Buddhism culture. After your short picturesque flight to Pokhara, we will transfer you to your hotel. You could chose to relax after the efforts made during the trek or wander around Lake Side with fascinating mountains panorama view and nature charming. we will give you all the necessary advices to enjoy this day in Pokhara. As on the first way, you could enjoy the beauty of the Nepalese countryside. Once upon arrival to Kathmandu, we will transfer you to your hotel. DAY 19 – Fly back home. Breakfast at the hotel and our team will transfer you to Kathmandu Airport. Special Trekking Permit US$ 500 per person for 10 days (the above price includes 10 days valid trekking permit from Kagbeni to Kagbeni. If you would wish to stay more than 10 days in restricted area, you are subjected to extra charge for extra days (US$ 50 per day / per person).